Popular STEM Challenge Sessions Added; Eddie Ballas Soccer for Youngest Kickers! STEM Challenge “Deep Dive” Sparks Learning; Popularity Sparks New Sessions! D-E 360° Summer Connections (SC) is excited to explore the resources of the newly-built Hajjar STEM Center at Dwight-Englewood School. The Hajjar STEM Center is a $20 million, architectural award-winning building that opened on the Dwight-Englewood campus less than a year ago, in Fall 2015. This summer, many SC Enrichment and Scholars campers are clearly enjoying and making the most of this beautiful new learning space. STEM Challenge, held in the Hajjar STEM Center and offered as a D-E 360° SC “Deep Dive: Immersive” program, challenges campers in grades 5-9 to spark learning and strengthen skills in science, technology, engineering and mathematics (STEM). And best of all, due to popular demand, additional sessions for STEM Challenge have now been added by the D-E 360° SC team! The week-long STEM Challenge session focuses on problem solving, logical reasoning, and collaboration skills. 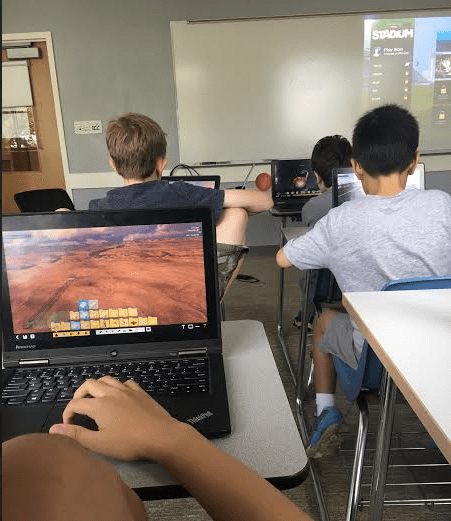 In STEM Challenge, our campers ‘dive deep’ into an all-day immersive experience with Computer Science, Art, and Electronics teachers to design and original robotic creation that can execute a mission to collect scattered supplies on the surface of Mars. Each student learns the electronics, coding and design skills to create a robotic vehicle that can sense its surroundings and move the lost supplies to a safe storage area on our mock-up of the red planet. Lead teacher Trevor Shaw is Director of Technology for Dwight-Englewood School (D-E) and also President and Founder of Genesis Learning. Shaw has been helping schools to leverage the power of technology as a learning tool since 1992. His experience has included designing the technology infrastructures for D-E and other independent schools, and he has championed plans for integrating technology into curriculum. He has also worked as a classroom English and technology teacher and has consulted for dozens of other institutions and served on the Board of Education of a New Jersey school district. Eddie Ballas Soccer: A Kick for Youngest Campers! D-E 360 SC is also excited to offer once again this summer not just one but two super soccer offerings that have proven to be extremely popular for our youngest campers. These Discoveries & Adventures (D&A) Special Programs are led by expert instructor and D-E coach Eddie Ballas. On Monday, August 1 through Friday, August 5, “Eddie Ballas First Kick” and “Eddie Ballas Soccer Mini Camp”, are available as Discoveries & Adventures Special Program offerings. These soccer clinics provide personalized instruction, skill centers, and exciting competitive games designed to enhance individual skills. “First Kick” is for campers entering preschool in Fall 2016 (ages 3 & 4 years old) and is in session from 3:30 – 4:30 PM; the “Mini Camp”, from 3:30 – 5:30 PM, is for campers entering kindergarten through Grade 5 in Fall 2016. Sessions will take place on Graham Field (grass) and Leggett Field (turf) on the beautiful D-E School campus. Enriching Experiences with D-E 360° SC! Enrichment camper athletes had fun in the sun this week (with an eye toward their safety in the heat of course! ), as they learned how to improve their techniques and courage in the New! 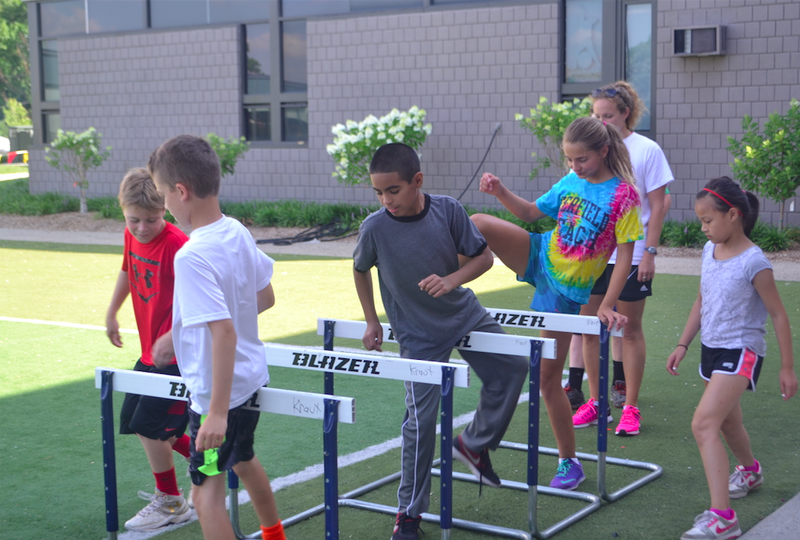 “Intro to Hurdles Camp”. They also began to develop effective warm-up and dynamic stretching routines! 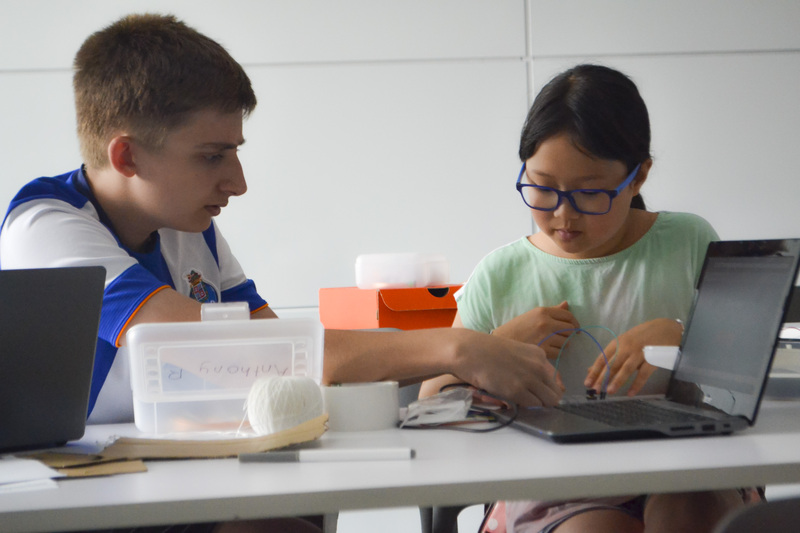 In a cooler (air-conditioned) indoor setting, Enrichment campers designed their own video games in “Game Design 1”, learning both the basics and some more advanced skills to create an amazing arcade or platform game! Newly-Added Enrichment STEM, Sports Sessions! Experience how real engineers would work together to design, build, and test balloon powered rocket cars! Teams will compete to determine which car can transport the most weight from one point to another. After discussing the scientific principals behind the process, students will have the opportunity to research, brainstorm, and work with various materials throughout the design process. In the end, competition points will be decided on both the materials used and the amount of weight the balloon cars can carry. Lawn sports are a great way to get outside without getting too sweaty or dirty. They are an opportunity for the game lover, the athlete, and the book-worm to all compete on a level playing field. Students will learn and get a chance to play several lawn sports including bocce, croquet, and Frisbee golf. This co-ed class is for boys and girls! Students will learn how to play flag football. For some kids, this may be their first experience with football or with any organized sport. The experienced teachers on staff will make the learning fun for all students. LIVE! Summer Showcase Events Tomorrow, Friday, July 15! Families and friends are invited and encouraged to attend the following end-of-session “Summer Showcase” events from our Enrichment campers, tomorrow, Friday, July 15! Campers enrolled in “The Debate” will be presenting beginning at 11:00 AM in the Hajjar Auditorium. “The Verdict” will be performed at 2 PM in the Hajjar Auditorium. July Food Drive Still Underway! Food Drive is still underway through Monday, July 25! D-E 360° Summer Connections (SC) is holding its annual July Food Drive. We are working with Englewood’s Center for Food Action, to help those for whom summers have been more difficult. We are asking all our SC families to help by donating nonperishables (e.g., canned goods) as well as baby products and toiletries, and to drop off these donations at the Discoveries & Adventures program desk in the D-E Lower School (Drapkin Hall). The drive is underway through Monday, July 25. Thank you for your support of this worthwhile cause! To download our July Food Drive info. flyer (PDF) please click here. Listed below are the featured dining menu items for the upcoming week, available to all our Enrichment, Scholars, and “Deep Dive: Immersives” campers. Additional dining menu options available include sushi trays, prepared sandwiches, wraps, salads, and more. Chef Luke also typically prepares for our campers a variety of tasty side dishes ranging from rice, potatoes, and french fries… to broccoli, squash, and carrots. In addition to lunch offerings, BREAKFAST items (including bagels, muffins, yogurt) and SNACKS (eg., chips, sweets and healthy treats) are also available to campers before the first morning session each day, beginning at 8:00 AM, and during session breaks. Campers can pay for their dining selections through a pre-paid or cash-payment basis.Lunch is typically included in the cost of our “Deep Dive: Immersive” offerings. Click here or visit our General Information page at http://de360.d-e.org/summer-connections/ for more details. Dining for our youngest campers in the Discoveries and Adventures (D&A) Program is handled separately, and information is available in the D&A information located at right / below. Questions? Call the D-E 360° Summer Connections Main Office at: 201-227-3144.